i got an email saying that the sickness caused by Diet Coke is the MS (multiple screlosis) (im not sure of the spelling!) because of the aspertame being put as sweetener. Hail to the mighty drink! Bottoms up, MM!!! Hi MM. I know how you feel. I was a Diet Coke fanatic too but I quit last August 1. Now’s the longest time I’ve been Coke free. I still consider it the best substitute to water as it is zero calorie. I loved putting all of it in a glass full of ice to the brim so that when I drink I could feel the fizz and the coldness of the beverage. Ang sarap. A patient has been challenging me to quit so I did. Remember the “New Coke” fiasco of the 1980s? Well, apparently, Diet Coke is “New Coke” with artificial sweeteners. Coke Zero, on the other hand, is “Classic Coke” with artificial sweeteners. That was a Eureka moment for me. Because I hated “New Coke” with a passion, it stands to reason that I would hate Diet Coke as well. Because I love “Classic Coke”, I like Coke Zero. Incidentally… the Coke Zero sold in the United States is sold in a lot of other countries as Coke Light. I’m not sure if the Philippines is one of them. ha ha ha it’s not the size that counts but the quality of the beholder. I heard about the aspartame scare (which did not stop me from drinking); I received an email about it being cleared out though, that it was ok to drink Coke Light (can’t say I can generalize all products containing aspartame). Yes, how can we give up our Coke fix. I actually like the British cousins of the 333ml Pinoy Coke. It puts a tolerable limit to what one can consume. I guess we finish the whole 333ml coz its just to be consumed. As we Pinoys would say…sayang naman. But what I’m looking forward to is trying the new Coke light version with added vitamins and minerals. Its name passes me now but I saw it in a Yoga magazine. Coke… a healthy drink?…I’m not complaining. At the Salcedo Market, Gil Carandang sometimes has fresh stevia. Across him is a stall that sells homemade bottled ice tea sweetened with stevia. I forget the brand, but I vouch that it’s great-tasting iced tea, sweet but not cloying the way some iced teas are. I believe he also sells at the Legaspi Market on Sundays. You should try it. I’m not anti-Coke, I love it too. In fact, I’ll even bring you home a can of the 8oz. mini Coke to add to your collection http://www.usatoday.com/money/industries/food/2006-04-12-portion-controlled-snacks_x.htm. I never really liked anything with artificial sweeteners, so i hated anything with the “Diet” word. I would choose water over any diet softdrinks period. But times a changing, i just got introduced by wifey to this new artificial sweetener “Splenda”, and kinda liked it with my coffee, but upon googling it, i still have some aprehensions, so im sticking with my regular “cane” sweetener for now. i love diet cherry coke….i heard the MS thing with aspartame too, but I got an e-mail that the diabetes Assoc. is trying to play it down bec. Sweet & Low sponsors them?!?!?!?!?! This could be a hoax too you never know — that’s why don’t believe 90% of the things e-mailed to ya!!!! this is the first time i came across mm.com and i love it this site! i will regularly check this now!! hehehe more power and merry Christmas!!! I’m gonna to dissent here: I prefer the taste of Pepsi Max to Coke Light. It’s sweeter without the weird aftertaste associated with diet sodas. I’ve never quite appreciated the taste of ‘lite’, ‘diet’ sodas. I guess the taste of aspertame in sodas doesn’t quite sit well with my tastebuds. My late dad was a huge ‘diet’, ‘lite’ Coke drinker…and left quite a few cans( he didn’t get cancer from it..it’s just his soda of choice bec he was diabetic)..But I do looove classic Coke and all sorts of flavored Coke…it’s my brand of choice. 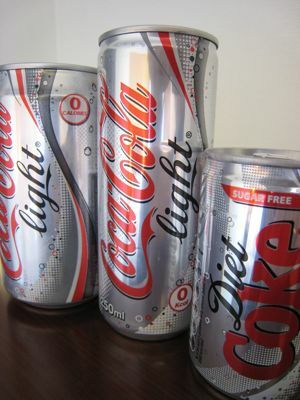 Here in Australia Coke, Diet Coke and Coke Zero (Zero is the Coke eqivelant of Pepsi Max) comes in 375ml cans. I remember reading that some Cokes made in Europe or S. America still use cane sugar and not corn syrup for regular Coke. They say it tastes better, but I’ll leave that up to the Coke-heads to sum up. Coke, the regular kind, is still my softdrink of choice. 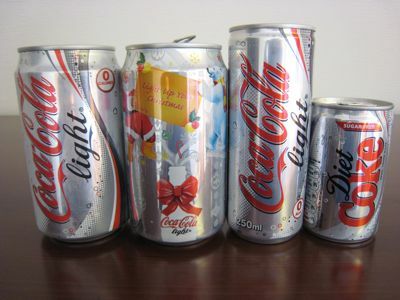 I have recently been to Japan and although found it quite difficult to find diet coke in restaurants over there, the many vendo machines all over the place had them, I found the most intresting shapes and sizes for Coke cans over there. too bad i didn’t take pictures. Yes, Coke made with cane sugar does taste slightly different and slightly better than Coke made with corn syrup. Here in the US, if you want Coke made with cane sugar you can look for Coke that’s made in Mexico, which a few shops and restaurants do carry. When I was in grade school, recess was always a sandwich with coke of sprite. It was all they served. Twice a day recess x how many years of school? Think of the truckloads of coke I must have drunk! Coke Light forever, aspatame scare be d***ed!!!! Was lucky enough to get a free trip to S.Korea and they have the mini version of Coke there too. Sayang, I wasn’t able to take a pic but it looks like a “Mini Me” of the regular sized Coke can. Cute! Tall diet coke for me too please with plenty of ice! I must admit though, I have been a traitor lately and have been enjoying Pepsi MAX. Does anyone remember Tab? I lived on bottles of of TAB in college.. I remember it tasted really bad but zero calories! The mini soda versions are common on almost all domestic airlines here in the U.S., i think the soda manufacturers just do this for the airlines. The tall can has some practical sense in it. The slimmer the can is, the quicker it is to cool (or as you and me like it, get ice-cold). Less wait. Good for picnics. Forgive me but since I came here in Qatar, I’ve switched my loyalty to Diet Pepsi although I was a coke fan before. Pepsi (regular and diet) just seem to taste better here and I love them in 355mL bottle with plastic resealable cup. We have those 150mL coke size here in Qatar and I see them a lot on-board some airlines. I am also hooked on Diet Coke my last round is at 4:00 p.m. If I have one after 4:00 p.m. it will keep me up until midnight. Diet coke and rum is a good drink especially in blazing hot summer months with barbecue or grilled hamburger- it is like traveling to Puerto Rico! i like the calorie-ful kind. hahaha. i can’t take the aftertaste of the diet sodas. though that’s what others(like you) look for. how do you like your soda? from glass bottle, pet bottle, can or soda fountain machine? hi guys! googled cherry coke and this page came up. I do hope anyone of you can help me here. Where can I possibly buy cherry coke? It’s still around right? This is my girlfriend’s (well ex) ultimate favorite softdrink and she’s been looking for these but we just couldn’t find them! It’s part of my Christmas present for her. I live in qc area by the way. Any chance one of you saw cherry coke in the grocery shelves? dude, I saw some cherry cokes at S&R a few weeks ago. I am not sure if they still have it in stock. Hi Marketman! Cool! I’ll check that out (and find someone who’s a member haha.) Thanks super!